Perth City and Beaches Scenic Flight - 2 or 3 passengers. Terrific value. ONE VOUCHER takes UP TO THREE PASSENGERS! Departing from, and returning to, Jandakot Airport (Perth). When we say this is a half-hour scenic flight, we guarantee AT LEAST 30 MINUTES AIRBORNE TIME on a terrific flight! Perth City and Beaches Scenic Flight - 4 to 6 passengers. Best Value Ever! Price shown is the total cost for a family or group. ONE VOUCHER takes UP TO SIX PASSENGERS! Departing from, and returning to, Jandakot Airport (Perth). We guarantee AT LEAST 30 MINUTES AIRBORNE TIME on a terrific flight! Voucher for 2 passengers, departing from Rottnest Island Airport. This scenic flight gives terrific viewing all the way around Rottnest Island. Ideal for aviation first-timers. See the whole Island, and then there's time to relax! Voucher for 2 passengers, departing from Rottnest Island Airport. This flight includes two complete orbits around Rottnest. High (around 600m) for an overview, then lower down for a closer inspection! Voucher for 2 passengers, departing from Rottnest Island Airport. Flying over Perth City, Fremantle and around Rottnest before landing back on the Island. Who would have thought, the best Perth City views can be found on Rottnest Island! Return trip to Rottnest in your own PRIVATE PLANE. Seats 1 to 3 passengers. ONE VOUCHER - UP TO THREE PASSENGERS! Give someone the easy way to go to Rottnest Island, and an experience that they will thank you for! A special round trip to Rottnest in your own PRIVATE PLANE. That is ONE VOUCHER takes UP TO SIX PASSENGERS travelling with speed and comfort. This gift will bring a great experience to a group or family who deserve it! 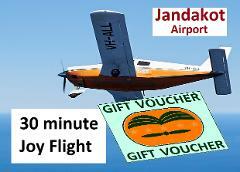 This $100 gift card can be put towards any Rottnest Air-Taxi Flights. VALID FOR - Scenic flights from Rottnest Island - Scenic flights from Jandakot Airport - Transfers between Perth and Rottnest Island. This $150 gift card can be put towards any Rottnest Air-Taxi Flights. VALID FOR - Scenic flights from Rottnest Island - Scenic flights from Jandakot Airport - Transfers between Perth and Rottnest Island. 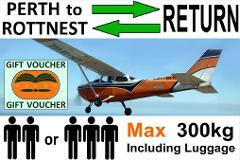 This $200 gift card can be put towards any Rottnest Air-Taxi Flights. VALID FOR - Scenic flights from Rottnest Island - Scenic flights from Jandakot Airport - Transfers between Perth and Rottnest Island. 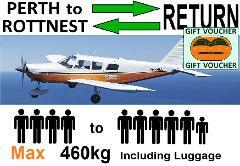 This $400 gift card can be put towards any Rottnest Air-Taxi Flights. VALID FOR - Scenic flights from Rottnest Island - Scenic flights from Jandakot Airport - Transfers between Perth and Rottnest Island.